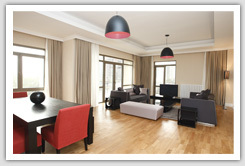 “Baku Palace” offers apartments for rent. If you are looking for comfortable apartment then “Baku Palace” is the best option for living in safe, kind and silent conditions. This is an ideal option either for having rest with family or for organization of business meetings in comfortable conditions and in extraordinary atmosphere. “Baku Palace” is offering wide range of services during a year and ready to satisfy the most distinguished requirements of residents of the apartment s that they would be able to get unforgettable impressions from accommodation. There is a museum of modern arts which is unique for its design in the first and second floors of our building. It will impress persons who are highly appreciating arts with its pictures and statues. There is also café and restaurant which is provided to serve visitors. “Baku Palace” is situated in a place which is ten minutes walk distance from the center of the city. Optimal planning of the building allows to residents as well as guests of our city to have amazing impressions from the beauty of the center of our city without spending much time for it. It is up to you to choose.